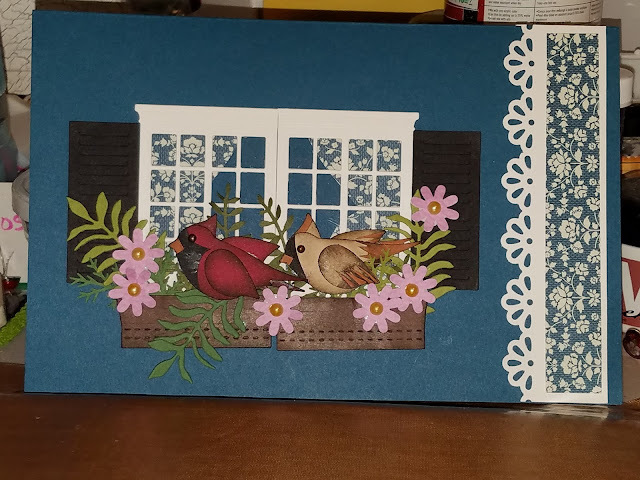 Here's a little shot of the card I made for my mom for Mother's Day 2017. I used dies from Mama Elephant to cut window frames, window boxes and shutters. I used punch from Stampin' Up! for my cardinals, flowers and stems. The lacey border is a punch from Martha Stewart. DSP, ink and cardstock are all from Stampin' Up! To make my cardinals I searched Google for a photograph of a male and female side by side so I could compare colors. My mom loves birds! In her living room she has her chair set up next to a window overlooking her backyard. She can sit for hours watching the birds come and go to her flowers and feeders. I was fortunate enough to spend this Mother's Day with my mom as well as my dad, my brother and sister in law and my hubs. It was a beautiful day. Hubs cooked brisket, potato salad and green beans. I made a cake and we all enjoyed our meal, our day and our visit! Hope all Mother's had a blessed day.